The trial of a protester who switched messages on billboards to denounce free trade treaties such as the Trans-Atlantic Trade and Investment Partnership and the Comprehensive Economic and Trade Agreement (CETA) opens on Wednesday at 2.00 p.m. at the Brussels Correctional Court. The activist, who is accused of sabotage and hacking, faces a prison sentence and a heavy fine if found guilty. 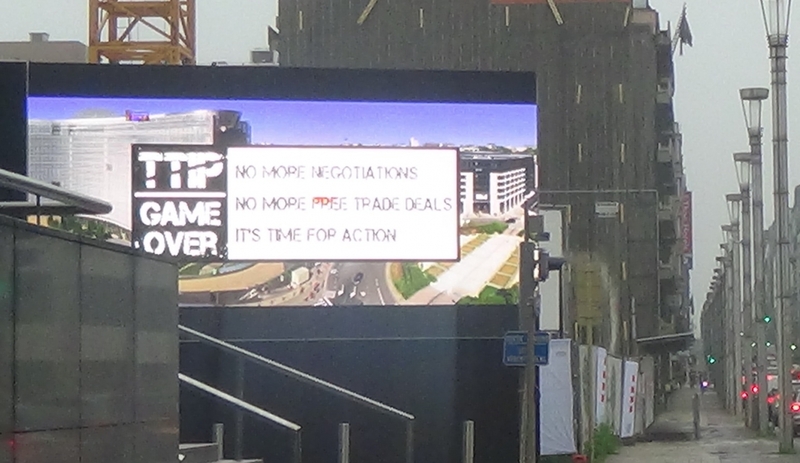 In July 2016, as part of a campaign against the TTIP and CETA, he transformed billboards, particularly Coca-Cola’s giant screen at the De Brouckère Square in Brussels, replacing the drink’s logo with the message: "TTIP Game Over - No more negotiations - No more free trade deals - It’s time for action". The "TTIP Game Over" campaign had urged citizens to organise direct, non-violent and civil-disobedience actions with a view to ending the free-trade negotiations. About a score of organisations such as the CNCD, Greenpeace, the Belgian human rights league, ecological groups and farmers’ associations have signed a declaration of support for the accused militant and called for a rally outside the law courts before the hearing. These organisations deplore the fact that the justice authorities have criminalised such action and used disproportionate means such as house searches simply because advertisements were modified.